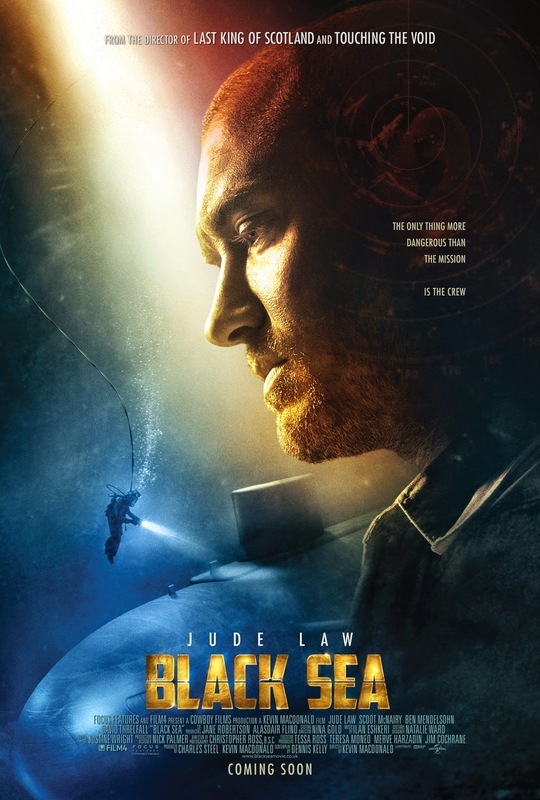 Out of work underwater salvager Captain Robinson (Jude Law) is told of a sunken WWII submarine full of Russian gold in the black sea. He convinces a wealthy investor to fund a submarine so he can and a crew of British and Russian submariners can attempt a mission to help retrieve the gold. Tensions run high when a lack of trust, communication issues, and greed start to drive a wedge between the crew. Now, it's not just a question of whether or not they get rich, but whether or not they even make it back alive. Have you ever seen a movie that made you physically feel claustrophobic? 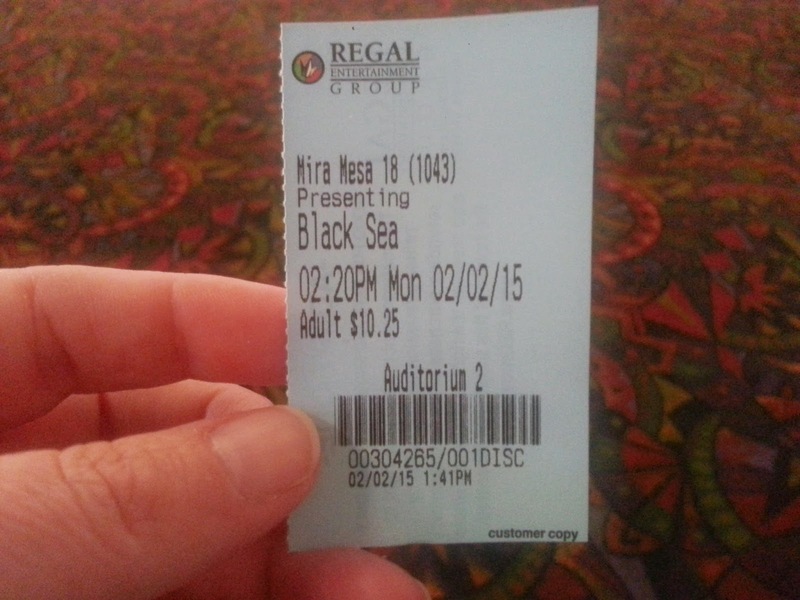 That's the effect "Black Sea" had on us for a good portion of the movie, so BRAVO to the filmmakers for making us feel so enclosed and cut off from the outside world! Knowing very little about this movie going into it, we must say, we were surprised with how much we liked it! Jude Law has made the switch from hunky pretty boy and leading lover to a grizzled, hardened and angry badass as of late in order to match his reciting hairline with relative ease and success. He is rather spectacular in this movie as Robinson, a submarine captain who has been fired from his job at a big-time oceanic corporation after over a decade of employment. Keeping this job for so long also resulted in the loss of his wife and son, who were tired of waiting around for him to return from sea. In an effort to help himself and some of his former employees strike it rich, a pissed off Robinson comes up with a plan to put one over on his former employer and navigate his crew to the Black Sea, where rumor has it, there is a Nazi U-Boat submarine laying untouched on the ocean floor filled with gold. A dozen or so men will receive equal shares of whatever gold is found after their initial investment is paid back to their backer...gee, a dozen or so men trapped in submarine with no windows headed towards the middle of the ocean for a risk they don't even know will pay off when gold is at stake? The answer is not what could go wrong, it's when will it start to go wrong? Donning what we thought was a decent Scottish accent the entire movie, Law portrays Robinson with a resounding conviction, going from a calm and collected captain to an insane and agitated tyrant at the drop of a dime. As soon as they get near the Nazi U-Boat, things, as expected, start to go wrong as tensions rise between each section of the crew. After an incident, The Russians band together against the Brits, and the language barrier becomes the least of their problems. There is a constant fear of death throughout the whole movie, and not just because the crew is in the middle of one of the deepest parts ocean with no one to know they are there, but also because money and gold and greed drive people to do crazy things like become violent and have murderous thoughts. Law is not the only standout performance in this film. Scoot McNairy plays Daniels, a claustrophobic right-hand man who ends up being forced to accompany Robinson and his crew on their mission at the behest of their shadowy backer. The audience never quiet knows what Daniels is up to as he never really seems to be all that claustrophobic in the first place. He is a fidgety bugger, someone who will whisper one thing in one man's ear and a different thing into someone else's, all to benefit himself. Between the amount of tension and enclosedness this movie offers, we really enjoyed it quite a bit. It won't be everyone's cup of tea, but director Kevin Macdonald adds little details, like actually filming in an old submarine, to make the movie feel more authentic. The film is captivating and engages the audience, and it kept our attention the entire movie. Not only is it thrilling, but it is rather exciting, too. It is definitely worth checking out, at least on DVD.